Here are a few questions I've been asked about the book. Be sure to contact me if you have a question! You're an animator. Is this an animation book? 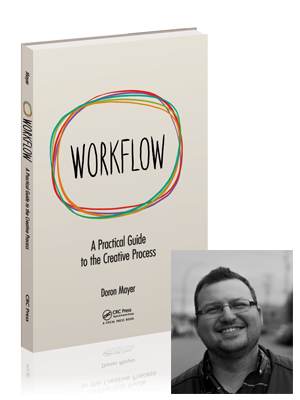 Workflow is a book about the creative process as a standalone skill. The methods in the book can certainly be used in animation and other visual arts, but also in writing, sound design, choreography, and many other creative fields that have nothing to do with animation. Are you doing any lectures or presentations based on the book? Absolutely. If you work at a creative studio, or are a student (or a teacher!) in an art institute, I'll be more than happy to connect with representatives of your studio/school and see if we can work something out. Again, just contact me! How did you come up with the "process as a standalone skill" idea? The story of how this idea (and book) came to be is described in the book's preface, which you can read here. I hope you'll read it - I think it'll give you a good idea of what to expect from reading it!